Here we are just out on a fun day sail - this is what you'll be doing soon! This is where it begins. Basic Sailing is a learn to sail course in which you'll get comfortable sailing a modern keelboat with two cabins, a head (restroom), a full galley, and other amenities found on a cruising yacht. Using the Skipper Certification rubrics, the Skipper Small Keelboat course will introduce you to rigging and systems below decks, teach you how to prepare the boat for departure, recognize wind direction and points of sail, maneuver the boat under sail and power, and safely return to the dock. You'll learn to be a competent sailor, and get the foundation you need for Basic Cruising, and Skipper (large keelboat) certification. Prerequisite: None. Come on down! State of the art online training topics include Weather and Sea Conditions, Electrical Systems, Rigging, Rules of the Road, Maneuvering in the Marina, Sailing, Communications & Navigation, Anchoring and Mooring, and Safety. Includes lifetime access to course materials. Complete prior to beginning your on the water training. We really want you to have the skills - we know that you do too. And we have high standards - actually, the highest standards. That's why our policy is that until we can absolutely, positively, check off on your practical abilities according to the ANSI sailing training and assessment standards (we hope that happens the first time), you can keep coming back for additional practical instruction, on the water, at no additional charge. 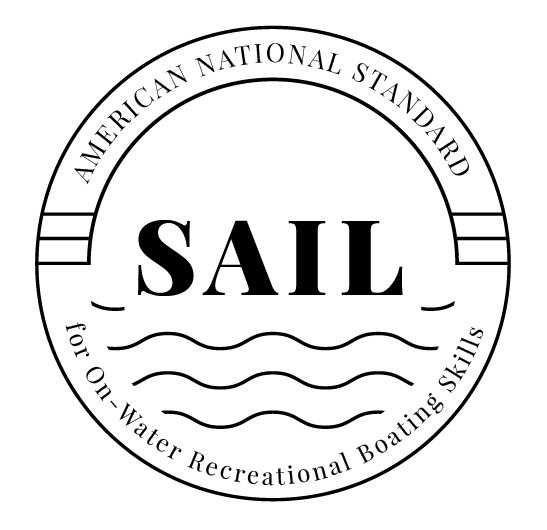 Here's what this guarantee means: when you get the certification, it'll be because you've shown us you that you have the knowledge, you can apply it on the water, and you can really sail the boat!